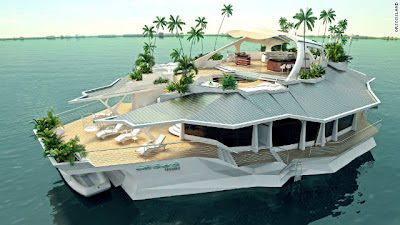 "The oval-shaped "Orsos Island" has been designed to combine the mobility of a yacht with the comfort of a house. It offers six bedrooms spread over three floors and 1,000 square meters -- nearly four tennis courts -- worth of luxury living space. [...] The island is the passion project of Hungarian-born entrepreneur Gabor Orsos, a former hotelier who wanted to combine the best features of luxury hotels with the flexibility that a superyacht provides. Measuring 37 meters long, the island can be anchored anywhere in the world its owner fancies."